Students of the Upper Iowa University School of Business Accounting Department will provide free income tax preparation at Fayette Campus on Mondays, February 11 – March 25. The Volunteer Income Tax Assistance (VITA) program will be provided from 4 – 6:30 p.m. each day in the second floor computer lab of the UIU Andres Center for Business and Education. Note: Due to the University’s Spring Break, the service will not be available March 4. 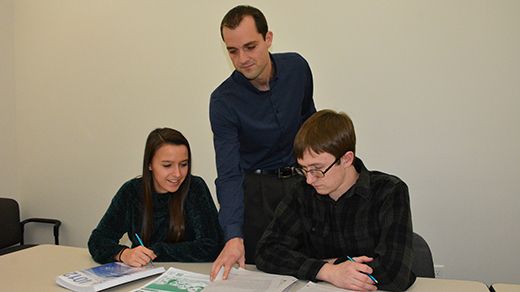 Upper Iowa University Assistant Professor of Accounting Blair M. Seim (standing) and student volunteers Molly Doran, Wheaton, Illinois, and Hunter Shomaker, Nevada, Iowa, are set to provide free income tax preparation at Fayette Campus on Mondays, February 11 – March 25. The Volunteer Income Tax Assistance (VITA) program is sponsored by the IRS. Individuals or families who generally make $54,000 or less during 2018, and persons with disabilities or limited English speaking taxpayers are eligible to participate. Both state and federal income taxes will be prepared and filed electronically. In addition to previously completing federal taxation coursework at UIU, each of the student volunteers preparing the tax returns has completed training for IRS certification. Those who participate are asked to bring a copy of their tax returns from the last three years or tax return transcripts, W-2s, and 1099s. The preparers will not have access to last year’s return information. To request a transcript, go to www.IRS.gov and under “Tools,” click on “Get a tax transcript.” After answering the questions, the transcript can be printed. Persons may also call 1-800-908-9946 and follow the prompts. Molly Doran, a junior accounting/financial management major from Wheaton, Illinois; Mauriah Harris, a sophomore accounting/business administration major from Chicago Illinois; and Hunter Shomaker, an accounting major from Nevada, Iowa, will be among those assisting with the tax preparation. For additional information regarding the VITA program at UIU’s Fayette Campus, contact Assistant Professor of Accounting Blair M. Seim at 563-425-5180.